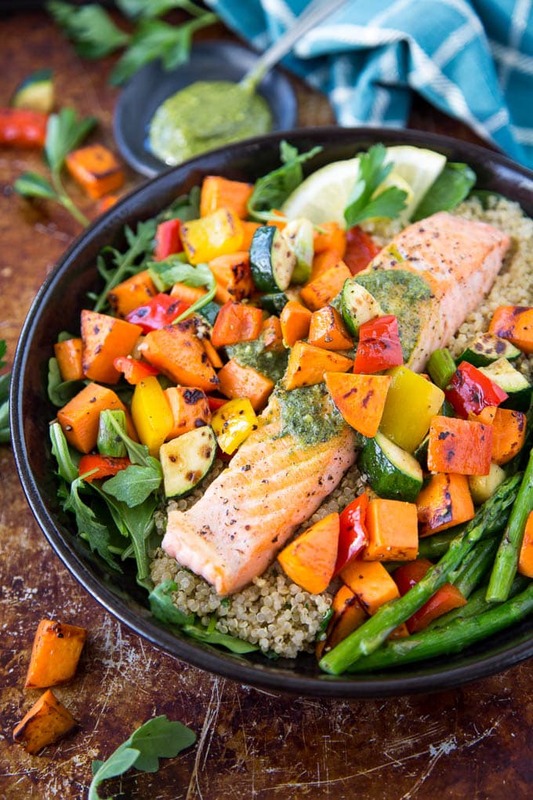 Roasted Salmon + Veggie Bowl ( Sheet Pan Dinner) – Healthy salmon and a rainbow of vegetables are cooked on one sheet-pan and served on top of a bed of arugula/spinach and quinoa. Topped off with some basil pesto and a squeeze of lemon. Perfect for an easy weeknight dinner. Well here we are…it’s 2018! I hope you had a fantastic holiday season spending time with family and friends. Wishing you all a Happy + Healthy 2018! Raise your hand if you maybe had a few too many holiday treats…says me who has two hands up in the air! While I normally eat pretty healthy, it’s sometimes hard to resist having a few too many holiday treats! especially when they keep showing up EVERYWHERE! I mean what’s a girl to do when her neighbor leaves homemade macadamia nut turtles and white chocolate cranberry biscotti on the doorstep? and the lunchroom at work is loaded with holiday cookies and candies? So, I’m ringing in the New Year with a big bowl of goodness! This Roasted Salmon + Veggie bow is lean, it’s tasty, and it’s exactly what one needs to start out the New Year on the right track ( or, if you happen to have better will power than me…keep things on track). I love the whole idea of “bowls”. A complete meal all in one bowl. A protein, an abundance of veggies and greens and a healthy grain of some sort ( the grains of course can be swapped out for more veggies if you’re following a low-carb, or Paleo style of eating). 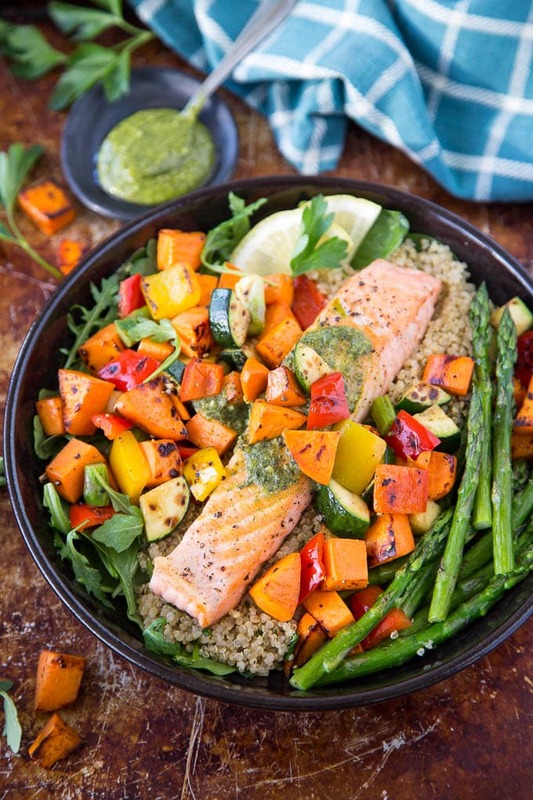 This Roasted Salmon + Veggie Bowl combines Omega 3 rich salmon and a rainbow of colorful veggies like sweet potato, zucchini, red and yellow bell pepper and asparagus. 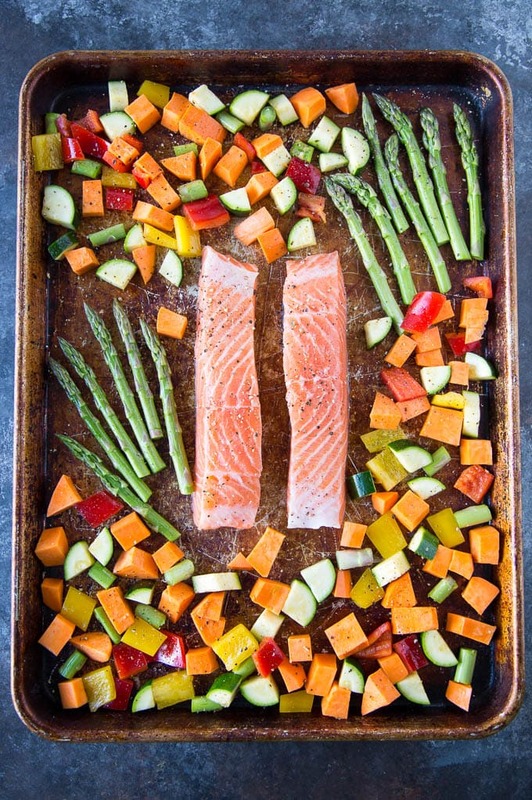 The beauty of this dish is that the salmon and veggies are all roasted on one sheet-pan, making this a super easy way to whip up a healthy dinner ( or to prep for healthy weekday lunches). Healthy spinach and/or arugula are topped with nutty quinoa and roasted salmon + veggies. I’m topping the salmon and veggies with a big spoonful of basil pesto and a drizzle of olive oil and lemon, giving it a bit of a Mediterranean flair. If pesto is not your thing, you could try a good balsamic vinaigrette or even a dollop of tzatziki instead . I’m extremely grateful for each you for making Simple Healthy Kitchen a part of your 2017! So cheers! Here’s to our health! and even more simple, healthy recipes and ideas to nourish and fill our bodies in 2018 and make eating healthy really really easy . 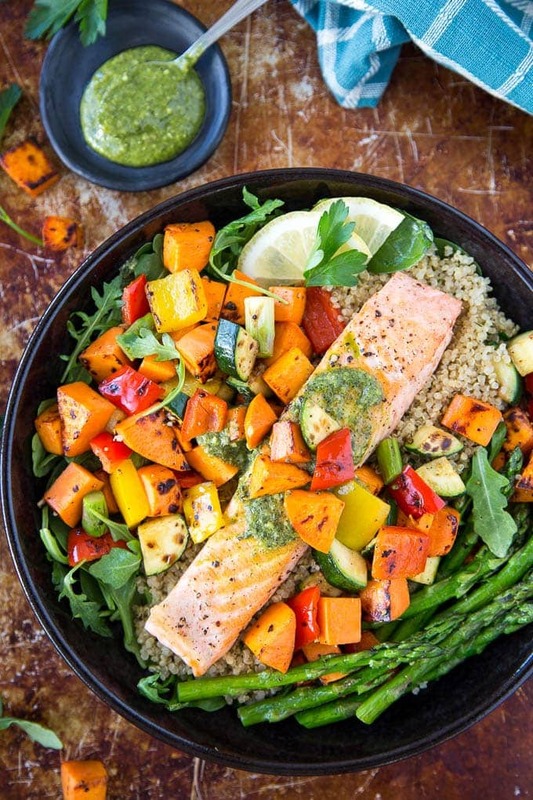 Healthy salmon and a rainbow of vegetables are cooked on one sheet-pan and served on top of a bed of arugula/spinach and quinoa. Topped off with some basil pesto and a squeeze of lemon. Perfect for an easy weeknight dinner. Preheat oven to 400 ° F. Line a baking sheet with aluminum foil or parchment paper, set aside. In a medium bowl add sweet potato, zucchini, bell peppers and asparagus. Drizzle with olive oil to coat vegetables. Salt and pepper to taste. If desired add a pinch of red pepper flakes. Place on prepared baking sheet, leaving room on the baking sheet for the salmon filets( which will be added later). Place vegetables in the oven for 10 mins. While vegetables are cooking prepare the salmon filets. Brush salmon filets with olive oil and generously season with salt and pepper. Remove vegetables from oven (after cooking for 10 mins.) and add the salmon filets to the baking sheet with the vegetables. Return to the oven and cook until salmon is cooked and vegetables are tender (about 10-12 minutes). Depending on thickness of your salmon filets you may need to adjust the cooking time. While salmon and vegetables are cooking, divide spinach/arugula between 2 bowls. If adding quinoa, mix cooked quinoa with chopped parsley and top spinach/arugula. When vegetables and salmon have finished cooking let salmon and vegetables cool for a few minutes and then divide between two bowls. Drizzle with a bit of olive oil and a squeeze of lemon if desired. Top salmon with a spoonful of pesto. * Nutrition info does not include optional grains. Nutrition info with quinoa: (per bowl) 484. 6 calories, 19.7 g Fat, 2.6 g Sat. Fat, 48.0 g Carbs, 8.5 g Fiber, 9.1 g Sugar, 32.0 g Protein. ** For Paleo option- omit grains and look for prepared pesto without Parmesan cheese.